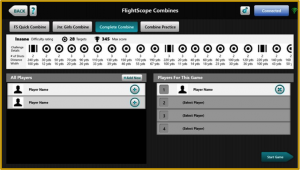 This practice game is even better with some sort of launch monitor like a Trackman, Flightscope, Foresight or (Other Monitor). Traditionally these units will come with a skills package built into the software. Skills challenge games are like the third game we’re covering but expands on hitting certain shots multiple times before moving onto another shot. I often do this with my students on the short game area where we would be graded from 5 to 10 shots. Many times, the grades given will range between scores pre-determined by proximity to the hole or if your ball finished inside strategically placed rings on the green. A Skills Challenge is a very easy game to implement into your practice and can take over from traditional ‘block’ practice. 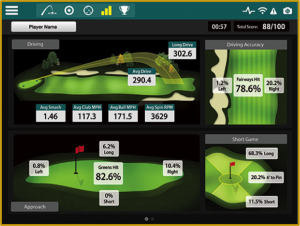 Each week a goal would be to increase the points made or improvement in the shots performed. This can help round out your game in multiple areas rather than just one at a time. In the opening monolog, I mentioned ‘block’ practice as a potential negative to you game. 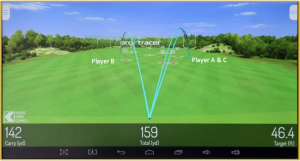 To avoid this style of practice many instructors have implemented a style of practice that would mirror that of playing 9 or 18 holes of golf on the driving range. The game would start on the first hole of a course you play all the time or a famous golf course you haven’t played before but have visited or seen of television. A club is selected, and a target established. The target could be between to flagsticks or markers defining the fairway. If a good shot is hit you would proceed with hitting an approach shot, or layup establishing another target. Now as we know sometimes bad or offline shots might be hit. If this is the case I suggest playing a recovery shot to get back into play or from around the green like punchouts, chips and pitches. This will put a premium on hitting better shots and allow you to work on what to do if you miss your targets. The only part of the game you won’t be doing whilst playing this practice session is putt. 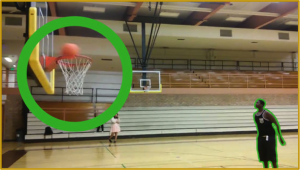 If the first person’s shot is missed, the second shooter may attempt any shot. If his/her shot is made, the opponent is obligated to duplicate it. Each time a shooter misses a shot that he/she attempted to duplicate, a letter is “awarded”. The game continues until one person accumulates 5 letters or H-O-R-S-E.
Now imagine the same format in golf. Players will matchup against each other and hit shots to various targets on the range, whether it be a green, flag, bunker or marker posts. These shots can be called prior to the first player hitting. They can be hit with any club and cover an array of differing trajectories and shot shapes. Instead of miss and make, it is governed by proximity to the target or closes to the defined shot, where the further away or worse attempted is awarded a letter. You could even change the letter scoring to G-O-L-F. 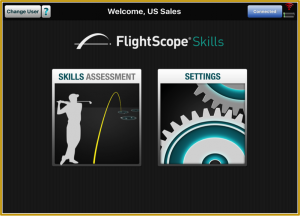 The image above shows how the game would work in golf. Player A goes first hitting an 8 iron directly to the intended target on the right side of the range. Player B goes second and pulls their ball left of the target. Player C goes last and hits an equally accurate shot at the intended target. Player B gets a letter and goes third on the next shot. However, if Player A’s shot finished further away nobody would receive a letter and the closest to the target would gain control in selecting the next target.